Penwarne Farm is conveniently located between The Helford River & the vibrant town of Falmouth, With over 8 beaches situated less than a ten minute drive away, you really will be spoilt for choice as you have the best of Cornwall at your fingertips, from our central location. Here you will discover miles of picturesque coast line, riverside pubs & quaint villages with traditional thatched roofed pubs. The area is home to an array of wildlife such as pheasants, bats kestrels & buzzards. You will find a choice of local boat trips & charters that can take you & your family out to see our local seals, dolphins & sea birds & recently Minky Whales have been spotted off the coast of Falmouth! We offer a peaceful setting on a working farm, ideal for laid back holidays with a large private garden providing plenty of space for children to run around & a great space for alfresco dining! There is a children's adventure playground & an onsite farm cafe, located in the campsite which lies at the top of the farm lane. Penwarne Farmhouse is on the edge of a complex of renovated barns with views out to Falmouth Bay, inland to Pendennis Castle. The property is well equipped with two 3 seater settees in the lounge which boasts a 40" SMART TV, internet access, a kitchen/diner to the rear of the property & to the front of the property there is a conservatory overlooking a large front garden which is gives you privacy for for entertaining & BBQs. There is plenty of parking adjacent to the property. We are in proximity to many of Cornwall's tourist attractions including world-class Trebah Gardens, The Helford River, Falmouth Maritime museum, Cornish Seal Sanctuary, Pendennis Castle, The Tate Gallery, The Eden Project, Flambards Theme Park, St Michael's Mount, Glendurgan Gardens, The Minnack Theatre, Paradise Park, Kynance Cove and The Lost Gardens of Heligan, all situated within a 5-45 minute drive away. The Helford is abundant with nature and beautiful creeks, including the famous Frenchman’s creek, one made famous by Daphne De Maurier as it was where she wrote of her treasured holiday visits that were inspired by this magical place. 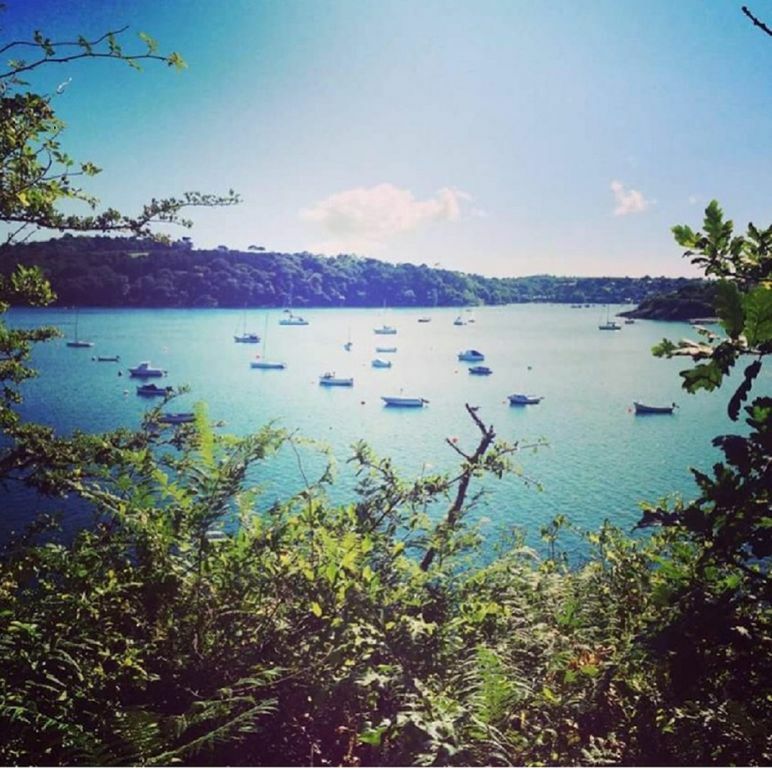 Visit the Helford Passage & get refreshed at The Ferryboat Inn, a gorgeous riverside pub, or hire a motor boat & explore the river or catch a ferry to the other side to walk around Manacan or have lunch at The Shipwright Arms. The SW Coastal Path is about a mile away. Falmouth is a short drive away & is an excellent place for all ages with its fabulous range of beaches at Gyllyngvase, Castle, Swanpool & Meanporth. You also have a large choice of shops & restaurants. Falmouth also hosts many vibrant festivals during the year including Falmouth Week, Oyster Festival, Sea Shanty Festival and occasionally the Tall Ships visit, not to mention the Red Arrows which usually come for Falmouth Week. Penwarne Farm provides the ideal location for your next escape from 21st century life. Come & join us on our peaceful farm, to reconnect with nature & enjoy the rural views over the Bay. Not only this, but some of Britain's most stunning coastal path lies in proximity, making the area popular with walkers wanting to explore & discover the local treasures that one may find washed up on one of our sandy golden beaches. Downstairs WC and wet shower room. Upstairs separate WC. Upstairs large family bathroom/shower. Lovely bright living room with two brand new 3 seater settees and a window seat. 40 SMART TV with internet access and DVD player. Large well equipped kitchin/diner with electric double oven with ceramic hob, dishwasher, washing machine, microwave and large upright fridge/freezer. Plenty of everying you need, a home from home. Golf available at Budock Vean Hotel approx 2 miles away and Falmouth Golf Club nearby. Everyone is welcome, we are happy for small groups to book and celebrations are fine, great private garden for entertaining, but no loud party's please as others are living on the farm. Good sized family accommodation. Large front garden with furniture & BBQ. Large front conservatory with well proportioned table & chairs. Fantastic views of countryside & Falmouth Bay. Large entrance porch with plenty of coat hooks and space for storing shoes, boots etc. Downstairs WC and wet shower room. Large kitchen/diner fully equipped for a home from home family holiday. Comfortable modern lounge with 40" SMART TV and DVD player. Two large double bedrooms and a single room with bunk beds. Separate WC and large family bathroom/shower. There is also a loft room which is suitable to be used as additional sleeping space provided by two single beds. This is only suitable for children over the age of 8 years old or fit adults as access is via a steep wooden loft ladder Plenty of parking adjacent to the property. Sorry but no dogs/pets allowed at this property. Outside: Large lawn in front garden with garden furniture and BBQ. Parking adjacent to the property. Utility Room: None Cleaning / Towels / Linen / Maid service: Bed Linen, bath & hand towels provided. Other: Large front conservatory with large table and chairs . Large entrance hall with piano & plenty of space for coats & shoes etc. Marilyn was fantastic from the moment we booked. She was quick to respond to my messages and answered all my questions. The house was fantastic, tucked away in a working farm, over looking the valley with sea views. With all the amenities my group needed, we had a lovely stay in Falmouth. Thank you Faith G. for your positive comments. I am so pleased that you all enjoyed your stay. The SW Coastal path is a mile away. Maenporth Beach,5 mins by car, 40 min walk. Maenporth is a safe, sandy beach with a beach cafe and WC's nearby. Parking next to the beach. Swanpool Beach is a safe, sandy beach with a beach cafe. WC's and parking across the road. About 10 mins by car. Gllyngvase is the closest beach to Falmouth Town. It is sandy, has a beach cafe and toilets nearby. Helford Passage is 5 mins by car, where you will find riverside pubs, boat hire & water-sporting activities. Newquay Airport 1 hour away by car. Penryn train station 10 mins away by car. Truro train station about 30 mins away. Nearest village Mawnan Smith 3 min drive. Falmouth 10 min drive. Falmouth boasts Maritime Museum, Pendennis Castle good variety of shops, gallaries and restaurants and boat trips. Glendurgan Gardens, Trebah Gardens, Penjerreck Gardens 5 min drive. Helford River 5 min drive, hire boats at Helford Passage or catch the ferry to the other side and enjoy another riverside pub with live music throughout the summer. Gweek and the Seal Sanctuary 5 miles away.